Well, it's Monday, I am back home and recovering from a great weekend's gaming up in Wellington! As previously mentioned, this weekend was Bedecon (Bunkers and Beaches), a 1750 point late war, Normandy themed tournament. 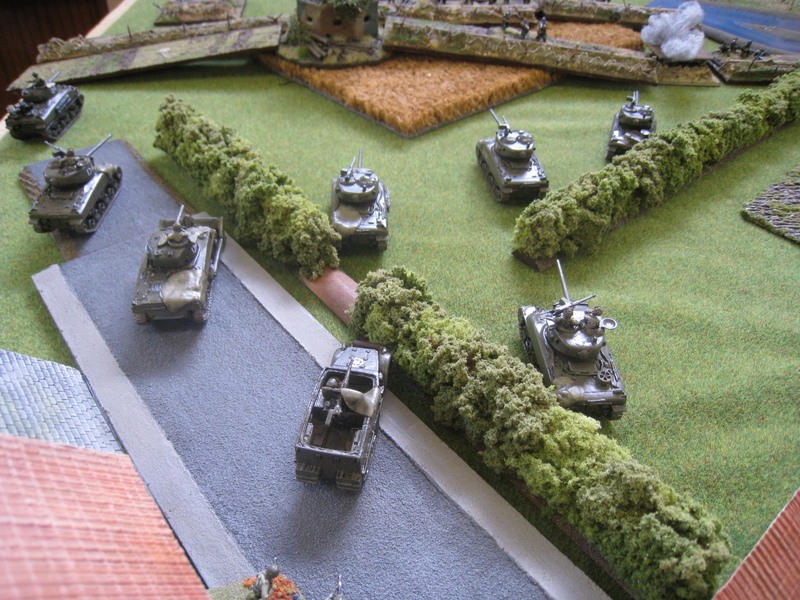 I was running my 2nd Armoured Division "Hell on Wheels", trying to push through the bocage during Operation Cobra. I played 5 games over the tournament, all Axis vs Allies (not everyone was so lucky), and got caught up in my games so much that I mostly forgot to take photos. Oops. The tournament was on the whole really, really cool. 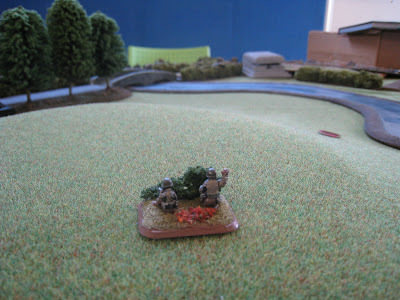 The tables had some great terrain on them, as well as some really interesting army list choices! Far too many Festungs and Bodenstandings companies for my tastes, but they were pretty darn common in Normandy! The 5 guys I played, Alex, John, Bede, Damien and Callum I would all play again. The platoon of 76mms racing around the wreckage of their opponents in Game 1. The observer looks out over the vast fortifications in front of him. Why yes, that is a PaK 43 bunker. Notice how you can see no tanks? It's because this is the picture of the other flank! There was no way I was going to be able to deal with that big mother head on. Highlights of the weekend? 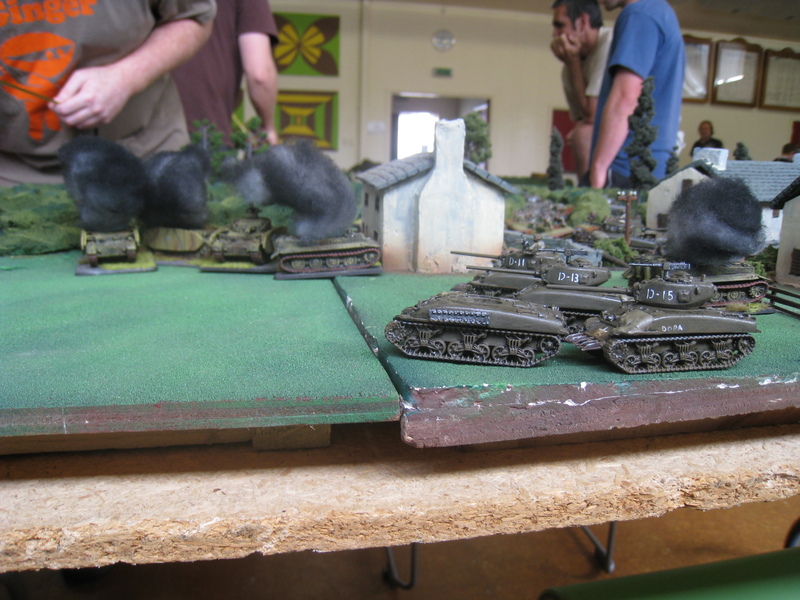 Turn one of the first game, the 5 76mm shermans spearhead move, then zip up to 2 tigers and proceed to blast them away with stabilizers. Toughest thing to watch was against Bede, where his ROF 3 tigers and 3 PaK 40s literally could not hit. Anything. At all. Which really cost him the chance of the win, because although my dice were average, they were better than absolute rubbish! Even worse was when he did finally hit with 2 shots, I rolled 2 sixes to save. It was tough to watch. Fail of the weekend? Well... I am going to claim that one. I asked Bede to look at his 3 early war books, and him being the gentleman he is lent them to me. So what do I do? Dribble a small amount of coffee on them. Not so much that they are ruined, just enough that there is a mark. Fail. Absolute fail. Bede took it like a champ, and new books will be winging their way to him shortly! The last word I will leave to what was one of the coolest models at the entire tournament, provided by Leamy. Big news on painting and projects tommorow. Thanks for sharing. I'd hoped to pop across for a look but didn't get the chance to get away (family weekend duties etc etc). I did manage a game at home with my son, we found the "Ace up the commando's sleave", was the Naval Gunfire - ripped into StuGs, Panzer iv's and infantry with ease... and the only way to 'kill it' , is to knock out the observor! Well done Poochie- no mention there of your placing- a very well deserved first and another 1-2 SMG finish! Glad we didn't haave to fight for a change- great weekend and already looking forward to next next years- Hungarians or Cossacks for me! Maybe we need a Nimrod theme. I am totally down with a Nimrod theme. Finns and Hungarians? The 1/2 SMG result is definitly positive! Not too worried about the win, the fun aspect was far more important in my book! The theme worked really well, but like you I'm not keen to face many more festung companies in the near future. Good write up and nice work mate! You didn't say you got first - well done Poochie. The even looks awesome, much more cool that the Masters. What's next year's theme? One happy accident of being unemployed is that (hopefully) I might be fully employed and actually able to do mad things like go elsewhere to play wargames in future. Next year's theme is "Winter War". So plenty of snow tables, rough rural russia! Expect bogging, and it to be bad to be a tank! There will be a special Axis and Allies challenge (as per this year), but that will be super secret until right before the day. Step One, Complete! Napoleonic British Based! 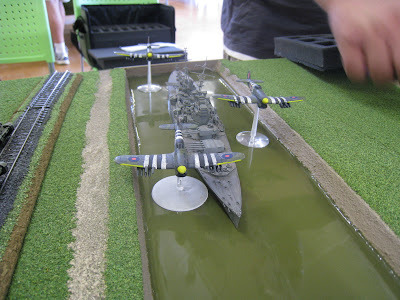 Kingdom of Brittania Fleet finished!